Murdock® Manufacturing is proud to announce that in 2019, we will release a brand new hydration station: the H2O to go!™ Bi-Level Drinking Fountain and Water Cooler! With Murdock’s Maintenance Advantage® patented auto-stop, the H2O to go!™ Bi-Level Drinking Fountain and Water Cooler features three stations – two drinking fountains and an integral H2O to go!™ bottle filler – for ultimate hydration! 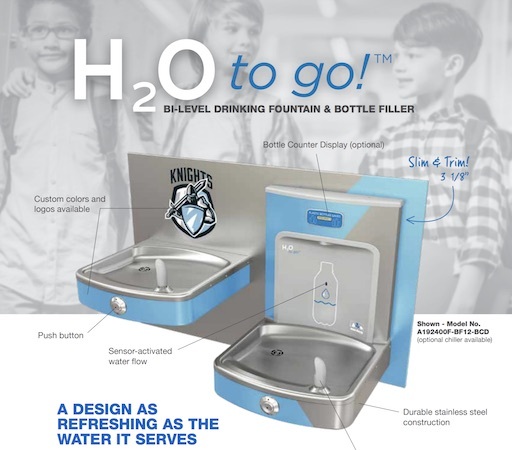 The H2O to go!™ Bi-Level Drinking Fountain and Water Cooler is fully customizable with custom colors and logos to bolster school spirit, or simply to enhance existing color patterns. A no-splash laminar flow provides quick 1 gpm flow rate. Automatic LED lighting brightens when a bottle is detected while a recessed bottle filler area provides for simple filling and drinking. Click below to learn more about the H2O to go!™ Bi-Level Drinking Fountain and Water Cooler today!